Racers are all about dropping weight. They cut out everything not needed to get rid of it. Then they figure out where to put it back in the car in a way that will help get the car from A to B as fast possible. This includes every possible inch of the car. It’s all about getting every ounce out of the car, and this practice includes the glass. Up until recently a common practice was to replace all of the glass with polycarbonate. However, sometimes the material would fog, or get scratched, if not cleaned in the proper manner. Plus, the quality of some polycarbonate products wasn’t the greatest, which further exacerbated these issues. Recently though, a company called Optic Armor started marketing its own high-optical grade polycarbonate. Optic Armor doesn’t manufacture the material, the company starts with a raw sheet, then forms it to fit the application. Optic Armor products have become popular recently because of the quality of the product. The company has come out of nowhere to provide a product that racers have started gravitating to, but what’s the big deal with Optic Armor windows? We’re about to tell you. Optic Armor’s windows are made from a high-optical grade polycarbonate, and is 50- to 75-percent lighter than glass. It’s shatterproof, flexible, can be cleaned with conventional glass cleaning methods, and is highly scratch and chemical resistant. Plus, not that we can drag race in the rain, but for open track enthusiasts and racers, Optic Armor glass features exceptional water shedding capabilities, making it possible to even race in the rain, if necessary. The Armor Coat feature offers excellent scratch resistance. This Optic Armor coating is applied in a Class 1,000 clean-room to make sure it’s free from contaminants. That’s one of the biggest drawbacks we see, pardon the pun, with glass replacement products. Its clarity has to be 100-percent perfect when achieving the speeds race cars are capable of producing. Scratches and a foggy film are detrimental to being able to see where you’re going. In a racing environment, that is not what you want. The Optic Armor windows also have a UV inhibitor that keeps yellowing at bay. Another nice feature of the Optic Armor replacement glass is that it is shatterproof. This serves two purposes. One, in case of an on-track incident, the glass won’t shatter, and possibly end up on, or in you. Second, the glass won’t shatter into a million little pieces on the track, and cause a lengthy clean-up. Neither are good situations, so that’s why it’s a good idea to check out Optic Armor Performance Windows. Weight is the biggest reason racers add Optic Armor windows to their race cars. In many applications, the weight savings is cut in half over factory windshields and back window applications. Taking a look at what Mustang applications Optic Armor has, the company carries oversized windshields, back windows, and side windows for 1965-’07 Mustangs. The windshields are available in a variety of thicknesses ranging from 3/16- to 1/4-inch. The windshields are also available tinted and with the aforementioned Armor Coat. When it comes to rear windows, Optic Armor has them for pretty much every Mustang, even the new 2015 model. The rear windows are available in thicknesses ranging from 1/8- to 3/16-inch, and in tinted and non-tinted. In drop-in window offerings, Optic Armor has them available for Fox Mustangs, and all the way up to the 2015 model. Before the back glass is installed in the car, it's trimmed, and the edges are cleaned up for a good installation. Optic Armor's oversized windows can be trimmed with a jigsaw to arrive at the desired size for your application. CNC makes the initial cuts to the windows, but leaves some meat on the bone to make sure they haven't cut off too much, and then sands it for a final finish. You know what they say, measure twice, and cut once, and those are words CNC's Gary Watson lives by. In talking to Optic Armor’s Jim Dunham, we were able to get more information on what the company has to offer Mustang enthusiasts. When we asked about applications, Dunham told us “We offer the oversized in more applications. The reason we make them oversized is that it allows them to be flush-mounted in some of the older cars.” The older cars had window trim, and clips to hold the trim in. The oversized windows allow the end user to either flush-mount the windows, or trim them to work with the factory clips and trim. “Since most of our windows are for racing applications, trimming them is not that hard, using a jigsaw,” Dunham says. With the oversized windows, if the person, or shop, is capable of building a race car, trimming the windows should come easy. “The drop-in versions, though, are able to be glued right in when you receive them,” Dunham adds. 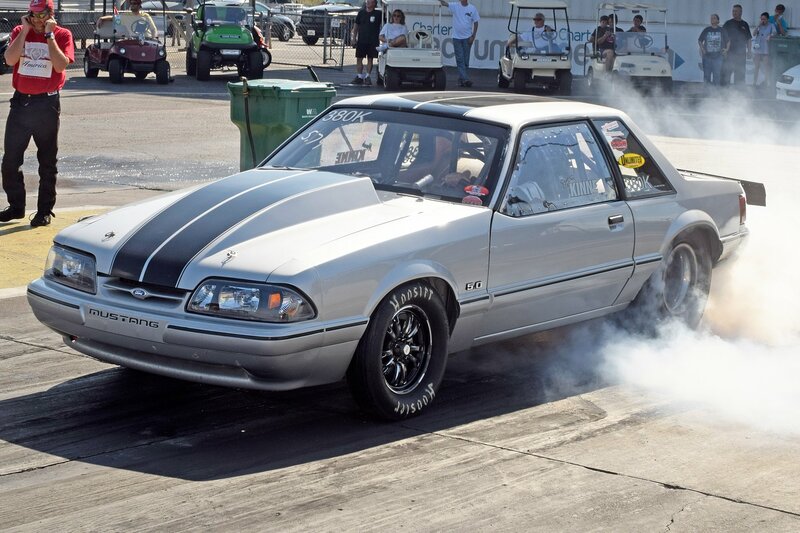 When it comes to safety in drag racing, Dunham tells us his background is in the sport, and so the company somewhat specializes in drag racing applications. For drag racing windshield applications, Dunham tells us 3/16-inch thick windows are good to 150 mph, and 1/4-inch is for 150 mph and faster. That is because at speed, the thinner window can distort. In some instances, reinforcing bars are necessary, depending on the application and sanctioning body rules. Regardless, it’s common for Optic Armor windows to be half the weight of factory glass. Once the Optic Armor rear window is trimmed to the desired fit, one last trial fit is made to make sure it's the correct size. CNC used 3M's Window Weld to install the Optic Armor windows. 'Window Weld seals great, but it also allows for a quick removal, should that be needed. It truly never dries,' Watson says. This is a rendering of the finished product. Unfortunately, the project is in a holding pattern at the moment. We key in on windshield and rear window installation here, but Optic Armor also carries side windows. For Fox Mustang applications, the company has a 3/16-inch side window available. Dunham says when working with a captured window like those in Fox Mustangs, Optic Armor has an application that functions just like the factory window. It can be rolled up and down either electrically or manually. The factory channel, and the Optic Armor window’s 3/16-inch construction keeps it from flexing, and pulling out at speed. For SN95 and later Mustangs, Optic Armor doesn’t recommend replacing the factory windows since those years don’t have a channel to surround it, but for a racing application where the window doesn’t move, Optic Armor has oversized applications to fill that need. We know what you’re thinking - What about Fox quarter windows, right?! The quarter windows Optic Armor has is a blank universal quarter window, formed and coated, and requiring a trim to fit. It’s not as easy an install as the front windshield or rear window, and most people just stick with the factory quarter window, anyway. Measure twice, cut once. -Gary Watson, Creations ‘n Chrome. To close, even though Optic Armor started out in the drag racing market, it’s trying to open up to more road racing applications. With the popularity of the American Iron series, the company is hoping to make a stronger push into that arena. With that, it’s going to be a matter of getting the Optic Armor name out there, and educating consumers and race teams about the benefits from adding its product. The purpose of marking the Optic Armor windows when installing them is to find the middle of the replacement window. From there, Creations N' Chrome makes cuts to each side of the window to arrive at what they are looking for. With the cars that leave CNC, Watson says there is about a 50/50 mix when it comes to cars that leave the shop with either factory glass, or Optic Armor windows in them.